Rock USA Festival 2017 will take place in Oshkosh, Wisconsin, USA on July 13-15, 2017. 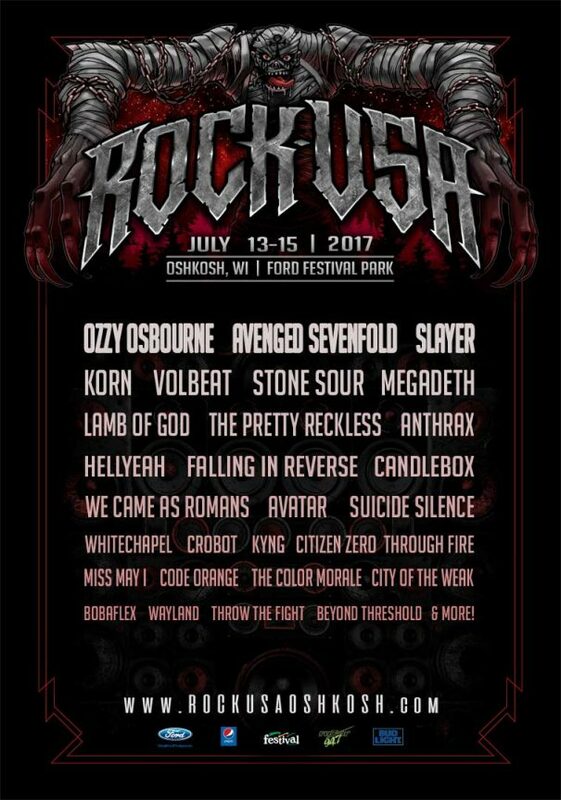 Ozzy Osbourne, Slayer and Avenged Sevenfold are among the bands that will perform at Rock USA Festival 2017. Welcome To Rockville 2016 will take place in Metropolitan Park, Jacksonville, Florida, USA on April 30 – May 1, 2016. Disturbed, Shinedown and Bring Me The Horizon are among the bands that will perform at Welcome To Rockville 2016 festival. Carolina Rebellion 2016 will take place at Rock City Campgrounds – Charlotte Motor Speedway in Concord, North Carolina, USA on May 6-8, 2016. The Scorpions, ZZ Top and Megadeth are among the bands that will perform at the Carolina Rebellion 2016 festival. Knotfest will take place in Foro Pegaso in Toluca, Mexico on December 5, 2015. Slipknot, Megadeth and The Dillinger Escape Plan are among the bands that will perform at the Knotfest Mexico 2015 festival. Hammersonic 2015 will take place in Jakarta, Indonesia on March 08, 2015. Lamb Of God, Mayhem and Vader are among the bands that will perform at the Hammersonic 2015 festival. Westfest 2015 will take place at Mount Smart Stadium in Auckland, New Zealand on March 03, 2015. Judas Priest, Lamb Of God and Fear Factory are among the bands that will perform at the Westfest 2015 festival. With Full Force XXII will take place in Löbnitz, Germany on July 03-05, 2015. Arch Enemy, Kreator and Agnostic Front are among the bands that will perform at the With Full Force XXII festival. Tuska Open Air 2015 will take place in Helsinki, Finland on June 26-28, 2015. In Flames, Alice Cooper and Bloodbath are among the bands that will perform at the Tuska Open Air 2015 festival. Graspop Metal Meeting 2015 will take place in Dessel, Belgium on June 19-21, 2015. Children Of Bodom, Judas Priest and Slipknot are among the bands that will perform at the Graspop Metal Meeting 2015 festival. Nova Rock 2015 will take place at Pannonia Fields in Nickelsdorf, Austria on June 13-15, 2015. Nightwish, In Flames and Slipknot are among the bands that will perform at the Nova Rock 2015 festival.